Opposition sources said Syrian Air Force officers were flying some of the MiG-23 and MiG-25 fighter-jets ordered to attack rebel-held towns in Libya. They said at least one Syrian Air Force officer was killed and identified after his plane was downed. Syria has sent weapons and other military equipment to the Libyan regime of Col. Moammar Gadhafi, the opposition sources said. Syrian opposition sources said the regime of President Bashar Assad has approved the deployment of hundreds of fighters to Libya as well as air and anti-tank munitions to Gadhafi. They said Syrians have also served as pilots for Gadhafi’s fleet of MiG fighter-jets. Syria said on Thursday it was against foreign intervention in Libyan affairs as Western states debated how they should respond to a popular uprising against Libya’s leader Muammar Gaddafi. “Syria affirms its rejection of all forms of foreign interference in Libyan affairs, since that would be a violation of Libya’s sovereignty, its independence and the unity of its land,” the Foreign Ministry said in a statement. Uprisings like those seen in Tunisia and Egypt have not emerged in Syria, where security forces keep tight control. Authorities have intensified a long-running campaign of arrests of dissidents and opposition figures. President Assad said there was no chance the political upheaval shaking the Arab world would spread to Syria, which has been controlled by his Baath Party for the last five decades. Assad said that Syria’s ruling hierarchy was “very closely linked to the beliefs of the people” and that there was no mass discontent against the state. Uman Rights watch reported on Thursday that Lebanese Military Intelligence agents detained at least six Syrians, all members of the Jasem family, on February 23 and 24, 2011, after they distributed flyers calling for protests demanding democratic changes in Syria. One of them, Jasem Mer`i Jasem, disappeared in the early hours of February 25 with two of his brothers who had gone to pick him up from a police station in Ba`abda, a suburb east of Beirut. Their family is concerned that the three might have been forcibly transferred to Syria. Woo! If that’s true then how does Prophet feels about this lol. 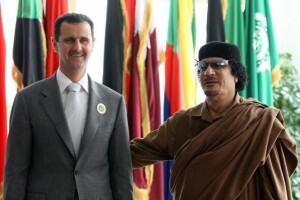 Your Syrian bodies helping Gaddafi? how does Amal feels about this too? if March 14th were helping Gaddafi, God help them. But its okay for Syria to do it. I guess Assad is afraid about his own regime. No wander the balance lately tipped in Gaddafi’s favors since the rebels been outgunned and outnumbered. Just because they supported the resistance, does not mean I tolerate their dictatorships. When the Syrian people rebel,I will support them as much as I supported the Libyans , Egyptians and all the Arab revolution.But they would have to do it on their own,If they want it bad enough. Good answer Prophet! and Nabil stop picking on Prophet. He has been more than fair in his arguments and balanced support for human rights. So leave him be you damned looser. nabil, the Syrians(the regime that is) are not my bodies,all Arab regimes are helping Qaddafi ,in the hope that prolonged crisis in Libya would slow down Arab revolts.